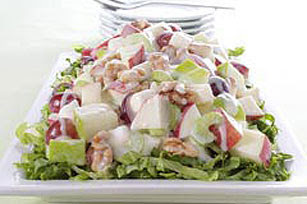 When I was asked to share a recipe for ACS' Healthier Holiday Table campaign I knew just the one: Waldorf Salad. It's been a tradition that my mother has made for years. Some call it Ambrosia, but either way my husband hadn't heard of it prior to us being married however he's now a fan. Waldorf Salad is a colorful, crunchy mix of fruits, celery, nuts and coconut surrounded in billowy clouds of creamy (aka fatty mayonnaise) heaven - oh and marshmallows and maraschino cherries too, if you're like my family! In other words, it's not your typical healthy fruit salad. With the ACS' recommendation to eat at least 2 1/2 cups of fresh fruits and veggies a day I knew that I could easily remix this recipe to make it healthier and better meet this recommendation. Mix apples, celery grapes and walnuts. Put fruit mixture into large bowl and chill. Combine Greek yogurt, honey and lemon juice and toss with chilled apple mixture. Turn salad into lettuce lined bowl or platter. Sprinkle with nutmeg for added warmth. Makes 6 servings. Looking for more ways to include cancer-fighting fruits and veggies into your daily diet? Here are two resources filled with ideas! If you'd like to check out more recipes and even share your own for making your holiday table healthier visit ACS' Healthier Holiday Table Facebook page. Disclosure: This is not a sponsored post. 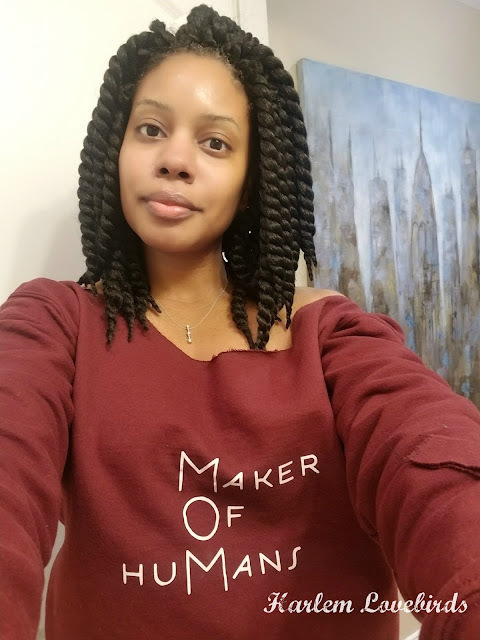 I was approached by a fellow blogger who asked me to participate in this effort and coming from a family affected by cancer I wanted to contribute.